A 14 year old Colorado boy was kept padlocked in a small room with no light and boarded up windows by his mother, Amanda Joliff, for all but a few hours a day. The teen was allowed one meal a day, if that, which came to a total of about four meals a week. The family’s house was filthy, smelled of urine, and was infested with mice. When Joliff and her boyfriend, Richard Smith, left home for several weeks, the boy escaped and was found hiding under a neighbor’s porch. 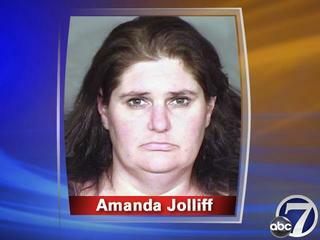 Joliff claimed the teen was “developmentally delayed” and said she locked him up because he “irritated” her. The teen had been removed from school to be homeschooled three years earlier and was registered as a homeschool student, but his mother was not educating him.